You could always import the Japanese version! Nintendo Life forum member slapshot82 recently wrote a letter to US publisher XSEED Games asking if the company would relent on its non-committal stance regarding the North American localization of Retro Game Challenge 2. Thanks for the kind words, but afraid it's not by choice on us not bringing over Retro Game Challenge 2 at this point when we're certain to lose money on it. No company can continue to exist if they take on projects they know they're going to lose money on, so as much as all of us here love the series and would like nothing more than to work on the sequel, afraid it's not going to happen anytime soon. It would seem that XSEED lost quite a bit of money on the original Retro Game Challenge, which is a shame because it's an excellent game. I think we knew this was a serious longshot after the sales of the first release. Shame too, as it's a great game. That's too bad. The sequel had even more variety of fake retro goodness. It might be the first game worth importing for me, although without knowledge of kanji figuring out all goals and secret codes could be a little tough. Personally I didn't know what retro game challenge was until a couple of months ago. Possibly the reason for the sales is that it's called Retro Game Challenge, and when people look on the back find no retro games they were fond of, then simply dismiss it. That's what I originally did anyway, I'll however endeavour to find a copy of the first game now I've seen some videos of it. I bet people would kill to get a copy if GC:CX were on the air in NA. Arino is awesome. There's only one thing left to do...IMPORT! And for anyone who hasn't yet,. 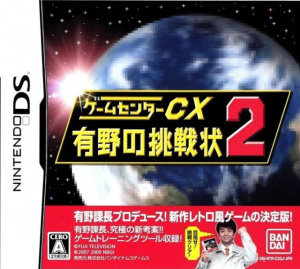 definitely check out Game Center CX (search on YouTube). Arino rules, and it's very cool to see not just the games being played (SMB2 and Ghosts n Goblins are particularly fun episodes), but things like his tour of various Hot Springs or the Northern tip of Japan looking for random game centers. Retro Game Challenge is seriously one of my favorite games I own for the DS right now. It's been my go-to game for quite some time. To anyone that hasn't already purchased this game, do yourself a favor and pick up a copy! But I can't read Japanese! I bet Retro Game Challenge ONE isn't coming to the EU then! Oh ffs! Yes, Please buy this game so we can get the sequel. Obviously nobody want to loose money, Its a shame that when a pure gem of a game comes along and a company takes a risk so many times the gamers are so slow to respond by purchasing the game instead of waiting on a price drop or bargain bin pick up. In this case it is probaly the cause that we may never see the sequel to this gem translated in English. Thanks guys for this page, really wasn't expecting this. I got a lot of respect for small time developers like XSEED and Atlus etc for taking risk and that is why I sent them the letter as well as letting them know that there are fans that really want the game as well. The prices on e bay for Retro Gmaes Challenge are still a little high actually, so I am waiting for them to go down. But at last XSeed is bringing Fragile to US shores, and I am incredibly grateful about that. Here's hoping they change they mind regarding Retro Game Challenge 2. The first one is fantastic and deserves to sell much better than it has. @Legend Marioid....Do yourself and all of us here a favor and spend the extra 5 or 10 bucks and buy it new for $30 to support the developer so we may possibly see the sequel released. Buying on ebay is the reason the developers are hurting so bad. How could you not buy enough of the first game to make it profitable? You people make me sick! I did my part; I bought the first Retro Games Challenge on launch day. Sadly not many else did. I was really hoping more people would buy it because its a really great game. Now we are probably never going to get the chance to experience a potentially awesome sequel. This is really sad. I don't blame XSEED either; I understand that their hands are tied and can only do so much. Its unfortunate because XSEED is a really great company that does so much for their fans. Its up to you folks out there! If you find a copy of Retro Games Challenge, please do yourself a favor and buy it! You'll be really glad you did! @Wolf....Thanks to you and very well said. I believe I bought Retro Game Challenge at release as well, on reserve from Gamestop. When the news that the sequel would require a leap in sales for the first game to be localized hit, I did my best to spread the word and made my brother get a copy (which he very much enjoyed). I guess it just wasn't enough. I haven't played it yet because slapshot82 is hogging it... HURRY AND FINISH IT SO I CAN PLAY IT!!! LOL isn't that a shame cause you gots my copy of Sonic Chronicles and Densetsu No Stafi 2 Lil Bro. .....oh And Rhythm Heaven lol.